Sergio Rodrigues, extendable dining table, rosewood, Brazil, 1965 Large rectangular dining table with rounded corners and a thick tabletop. The table is extendable with an additional, folded leaf that is stored underneath the tabletop. 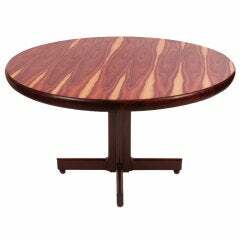 The rosewood has a wonderful brown-ruby color and shows a beautiful grain on the tabletop and the frame. The frame and feet are made of solid rosewood, which is quiet rare to find. Highly functional table, which can be used as dining table, desk or conference table. The prolific architect and designer Sergio Rodrigues is often called the "father of modern Brazilian design," but it is the second adjective in that phrase that deserves emphasis: Rodrigues’s great achievement was to create furniture in a style that captured the spirit, character and personality of his country. Modernity came slowly to 20th-century Brazil, politically and culturally. The nation finally realized genuine constitutional democracy in 1945, ushering in a new, progressive era in the arts. Until that time, heavy furniture based on historical European models had been the norm. In the late 1940s, designer Joaquim Tenreiro introduced sleek, minimalist chairs and cabinets; José Zanine Caldas, now best known for his later artisanal work, created plywood furnishings for mass-production; the Italian architect Lina Bo Bardi, a former editor for the Gio Ponti-founded magazine Domus, set up shop in São Paulo, designing elegant, flexible chairs set on slim metal frames. This was the heady scene into which Rodrigues, the son of an artistically prominent Rio de Janeiro family, arrived after graduating in 1952 from the national university. He established Oca Industries in 1955, a company that would become the preeminent maker of modernist furniture in Brazil. When architects Lúcio Costa and Oscar Niemeyer were tasked in 1956 with the whirlwind project to plan, design and build the new capital, Brasília, in five years, they used Rodrigues’s early chairs, with their softly-contoured lines and caned seats and backrests, to furnish many of the buildings. Rodrigues would realize the true expression of his talents in — and garner international awards and acclaim with — his Mole chair of 1957. The word mole means "soft" in Portuguese, but can be interpreted as "easygoing" or even "listless." Rodrigues's chair features a sturdy, generously proportioned frame of the native South American hardwood jacaranda, upholstered with overstuffed leather pads that flap like saddlebags across the arms, seat, and backrest. It is a chair that invites sprawling — perfect for the social milieu of the bossa nova and caipirinha cocktails; where a languorous afternoon spent chatting and joking is the apex of enjoyment. Most of the estimated 1,200 chairs, sofas, tables, beds and dressers Rodrigues designed in his long career are imbued, in one way or another, with this air of robust relaxation. Sergio Rodrigues was a designer true to the temperament of his people. Sergio Rodrigues "Alex" dining table. A dining table by Sergio Rodrigues with jacaranda base and etched white marble top. Brazil, circa 1950s.